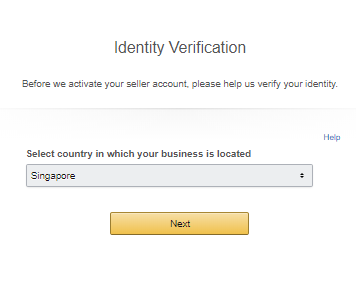 In order to successfully create an Amazon Seller account to sell on Amazon marketplaces in North America (US, Canada and Mexico), Sellers need to pass the Seller Identity Verification (SIV). This page provides guidance on the required documents for SIV and the step-by-step process. Must be a government-issued identity card that is distributed and recognized by the country where you are a citizen or resident. 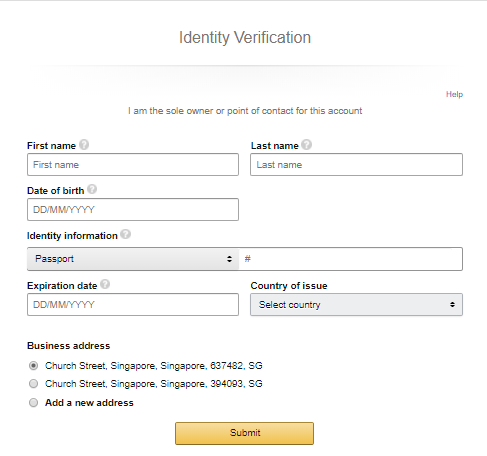 The full name on the national ID should match the full name on your registered Amazon account. Scan the original document in color or take a picture using your mobile device. Do not submit a screenshot. Black and white copies are not accepted. Copies should be legible. The document image must be high quality, colored and unobstructed. The image must show a full document page or in case of national ID, both sides of the card. The document should not be expired. Your identity document must be in one of the following languages: Chinese, English, French, German, Italian, Japanese, Portuguese, or Spanish. If it is not in one of these languages, provide a copy of your passport or a notarized translation of your document in one of these languages. If you submit a copy of your passport, please ensure that the passport has the bearer’s signature. Document should be less than 10MB in size. Accepted formats are *.png, *.tiff, *.tif, *.jpg, *.jpeg, and *.pdf. Do not include special characters in the file name (Examples: $, &, #). Companies/Corporations need to submit a government issued national ID for the primary contact or beneficial owner. The name of the point of contact or company mentioned on the statement should either match the point of contact name or business name provided during registration. You can hide the currency amount, but the document must remain intact and other information clearly visible. Scan the original document in color or take a picture using your mobile device. Do not submit a screenshot. Please do not provide a photo of your credit card or debit card. Your document must be in one of the following languages: Chinese, English, French, German, Italian, Japanese, Portuguese, or Spanish. If it is not in one of these languages, provide a notarized translation of your document into one of these supported languages. Step 1: Select the country where your business is based as shown in Figure 1. (*Please note that information on this page cannot be changed after submission; so, please enter the information carefully) Click next and when directed to the following step (shown in Figure 2), enter the following information accurately and click submit. 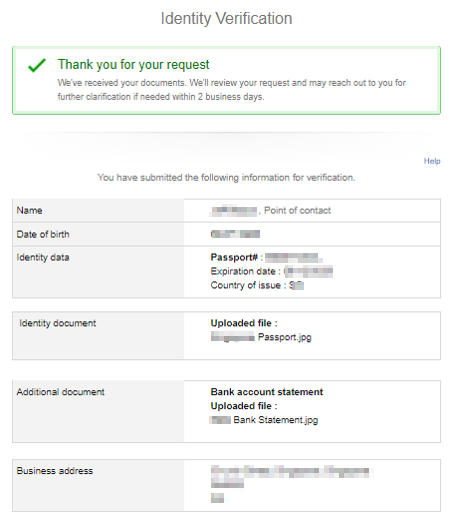 Step 2: Submit scanned copy of national ID (Passport etc.) and ensure the document meets the guidelines mentioned above. Step 3: Submit scanned copy of credit card statement or bank account statement. Please ensure that the conditions mentioned above for credit card or bank statement are met. Step 4: If the necessary documents and information are validated, the following will appear. If the message shows ‘Thank you for your request’, you can close the tab on your browser. Otherwise, ensure that all information and documents are submitted accurately. Documents submitted have to be in the given format mentioned above. With a successful submission, Amazon will review your request and may reach out further for further clarification if needed within 2 business days. 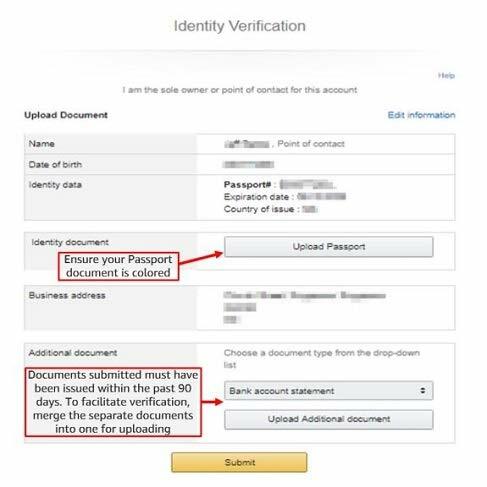 Step 5 (if applicable): You may be asked for the following additional documents by Amazon Seller Performance Review team. 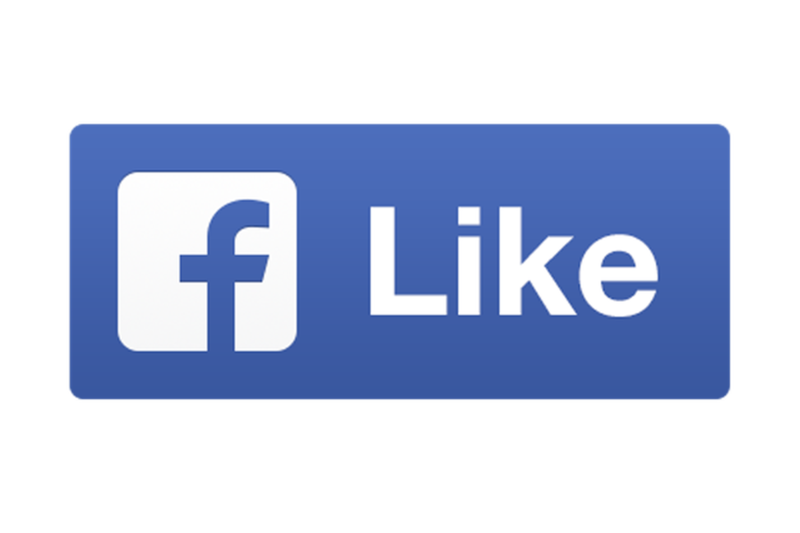 Please follow the requirements for utility bills mentioned above in this page, and submit the documents via Seller Central. Utility bill with name and address visible. Name and address should match with the name and address provided during account registration. The utility bill could be a water, electricity, gas, internet or telecom bill issued by the utility company. The bill must be issued within the last 90 days. If you can’t provide valid utility bills, please provide a valid copy of your passport or bank statement or National ID. Please note that Payoneer statement is not accepted as bank statement for Seller Performance Review. You can send files in .pdf, .png, or .gif format. These documents must be authentic and unaltered. You may remove pricing information, but the rest of the document must be visible. In Seller Central, you will see a notification that says Amazon has suspended your account (as shown in Figure 5). Click on the flag or “Read more” link to see all performance notifications. Please read the email notifications and provide the requested documents. Throughout your Seller Identification Verification process, do use the ‘Get support’ button (available for Sellers who register for the Professional Selling plan only) to get support regarding any questions or issues related to Seller Identity Verification.